"The only thing more dangerous than the mission is this team of renegades." EuropaCorp USA has debuted a brand new official trailer for the action heist thriller titled Renegades, formerly known as The Lake. This was originally set for release in early 2017, and the first trailer debuted in 2016, but it's just now getting to theaters this fall - apparently. The film tells the sort-of true story of a team of Navy SEALs who try to find long-lost Nazi gold at the bottom in a lake during the Bosnian War in the 90s. The eclectic cast includes J.K. Simmons, as well as Sullivan Stapleton, Ewen Bremner, Sylvia Hoeks, Diarmaid Murtagh, Charlie Bewley, Clemens Schick and Dimitri Leonidas. They're totally overselling this now with all the big action, guns, tanks, and wise-crackin' American patriotism from these elite SEALs. Whatever works. You can still watch the first official trailer for Quale's Renegades (from two years ago!) here, to see more. 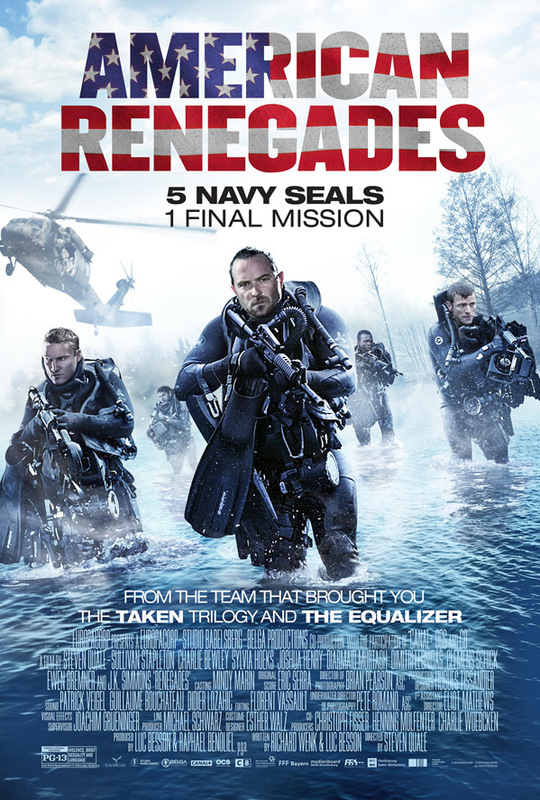 In American Renegades, a group of Navy SEALs tries to solve a long-forgotten mystery while uncovering an immense treasure hidden in a lake in war-torn Serbia in 1995. Renegades, originally titled The Lake, is directed by filmmaker Steven Quale, of James Cameron's Aliens of the Deep, as well as the 3D movies Final Destination 5 and Into the Storm previously. The screenplay is co-written by filmmaker Luc Besson (who also produced) and writer Richard Wenk (The Mechanic, The Equalizer, The Magnificent Seven). This already opened in a few countries back in 2017. EuropaCorp USA will finally release Quale's Renegades in theaters starting December 21st this fall, then VOD on Christmas Day, December 25th. Still interested?